Carbon dioxide is always in the atmosphere as part of the Earth's carbon cycle. The global carbon cycle transfers carbon through the Earth’s different parts - the atmosphere, oceans, soil, plants, and animals. So carbon moves around — it flows — from place to place. Carbon dioxide (CO2) is the main greenhouse gas emitted through human activities. Human activities are changing the carbon cycle. First, by adding more CO2 to the atmosphere, mainly by burning fossil fuels. Also by changing the ability of natural sinks, like forests, to remove CO2 from the atmosphere. Human-related emissions are responsible for the increase that has occurred in the atmosphere since the industrial revolution. The carbon sinks, on land and in the oceans, have responded by increasing the amount of carbon they absorb each year. Carbon sinks cope with about half of human greenhouse gas emissions. The other half has accumulated in the atmosphere. Daniel Rothman, Professor of geophysics in the MIT Department of Earth, Atmospheric and Planetary Sciences and co-director of MIT’s Lorenz Center, has identified “thresholds of catastrophe” in the carbon cycle that, if exceeded, would lead to an unstable environment, and ultimately, mass extinction. 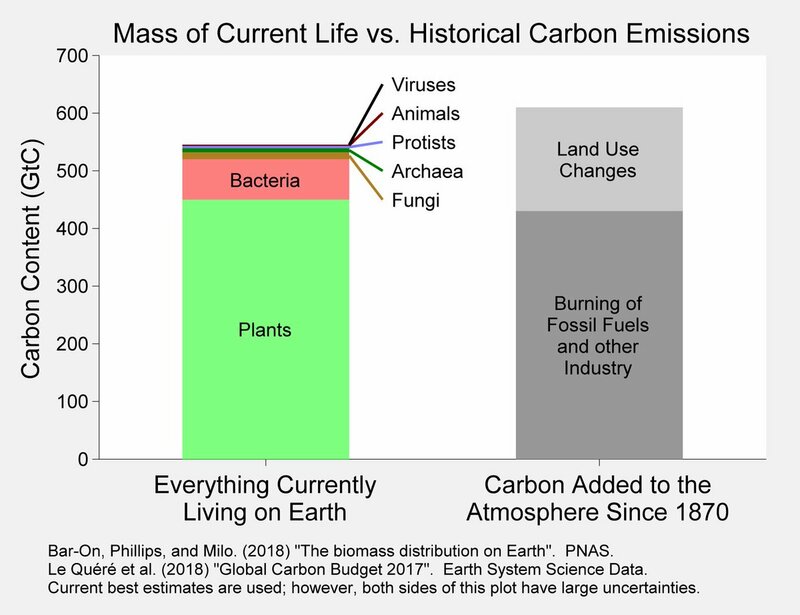 The diagram above shows a comparison of the current mass of all life on Earth with the amount of carbon that humans have added to the atmosphere since 1870. Humans have now burned through the equivalent of an entire biosphere.